As you can identify from the yellow-highlighted lines in the previous screenshot, not all item transactions are included in the inventory value report. 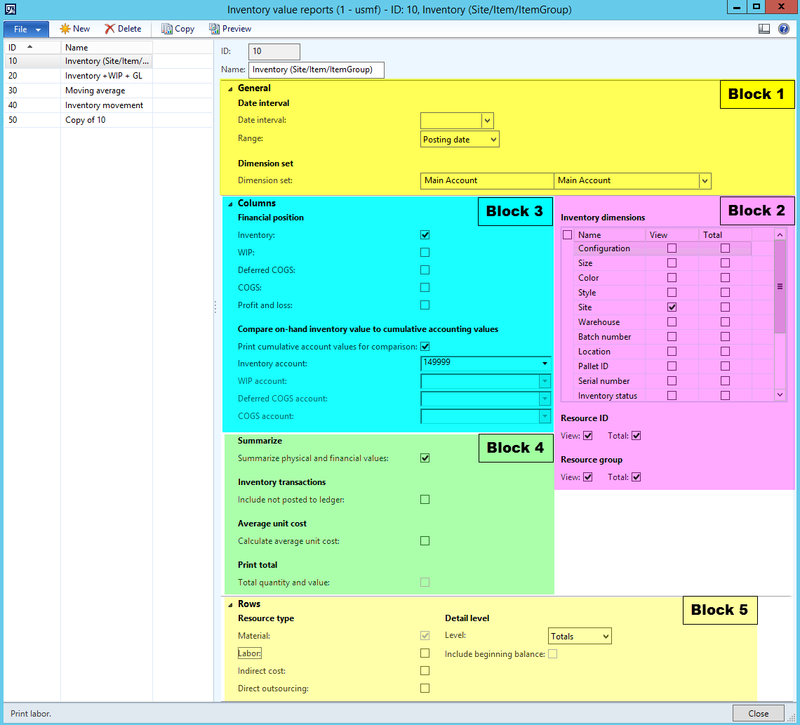 The on-hand inventory form possibly provides a better view on the sample item transactions and allows a straightforward reconciliation with the inventory value report data. Please see the following screenshot. As you can identify from the previous two screenshots, only physically and/or financially updated inventory transactions are included in the inventory value report. Inventory transactions that do not have a related physical and/or financial value, such as purchase order registrations or sales order picks are excluded from the inventory value report. One of the first things that I tried to do was analyzing the transactions of the first test item (“L1000”) only. As all transactions for this item have been recorded in January 2015, I run the inventory value report for the following date interval. What you can identify from this inventory value report is that the ledger transactions that are shown at the end of the report are limited to January 2015 and that a variance of 14250 EUR arose. This variance is caused by the inventory transactions for the second test item “L1100” that were recorded in February 2015. This outcome is very important for reconciliation purposes as only the General Ledger transactions but not the inventory transactions are influenced by the date interval entered for the inventory value report. You can identify this by the blue-highlighted line in the upper part of the inventory value report. This line shows the item transactions for the second test item “L1100” that have been recorded in February 2015. A direct result of this outcome is that you have to run the inventory value report at month-end before any future inventory transactions have been entered for the next month if you want to reconcile your General Ledger with your inventory balance for the end of a specific month. 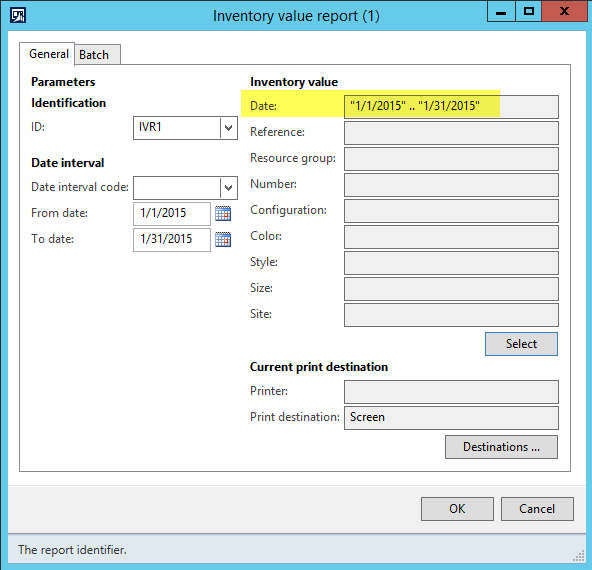 That is because the inventory value report does not show inventory values as of a specific date in the past. Unfortunately, this second filter on the inventory transactions is not picked up by the inventory value report and results in the same outcome as before. 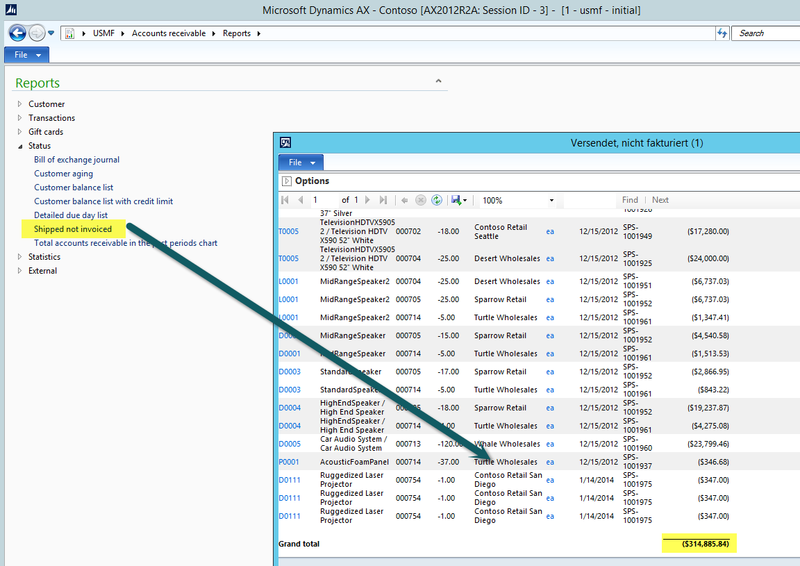 All transactions and results presented in this blog post were executed on a Dynamics AX 2012 R3 “Contoso” demo system that can be downloaded from Partnersource. 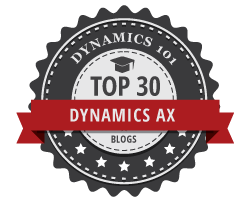 Numerous additional tests showed that the identified first problem with the date interval does not exist in each and every system but rather depends on the Dynamics AX 2012 version used and the hotfixes implemented. Whether or not you will face the first problem described in your system can thus not be answered conclusively here. What you can see from the previous screenshot is that several unresolved issues with the inventory value report seem to exist and that you have to take utmost care when using this report. 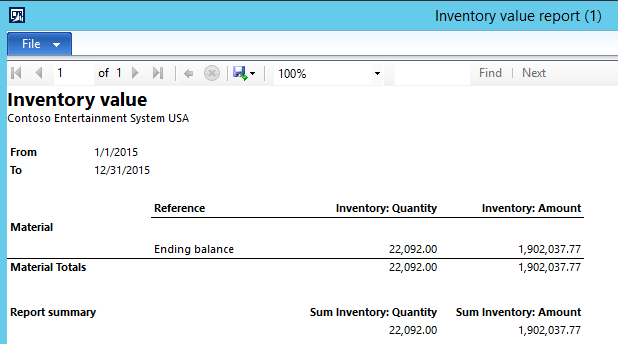 A second problem that I observed with the inventory value report is that no guidance/white paper or something alike is available for the setup of the summary ledger accounts that are linked to the inventory value report. As a result, you always run the risk that you miss the one or the other ledger account resulting in a reported variance that actually does not exist. For testing purposes I setup a new inventory summary account (“149999b”) where I excluded the ledger account that is used for recording packing slip transactions for the item group “Audio” and that is included in the original summary account “149999”. Please have a look at the next screenshot. With the newly setup inventory summary account in place, the inventory value report shows a discrepancy of 900 EUR between the inventory and ledger balance. This amount is identical to the ledger balance of account 140201 that was explicitly excluded for testing purposes. Unfortunately, the inventory value report does not give any hint that this account is missing. 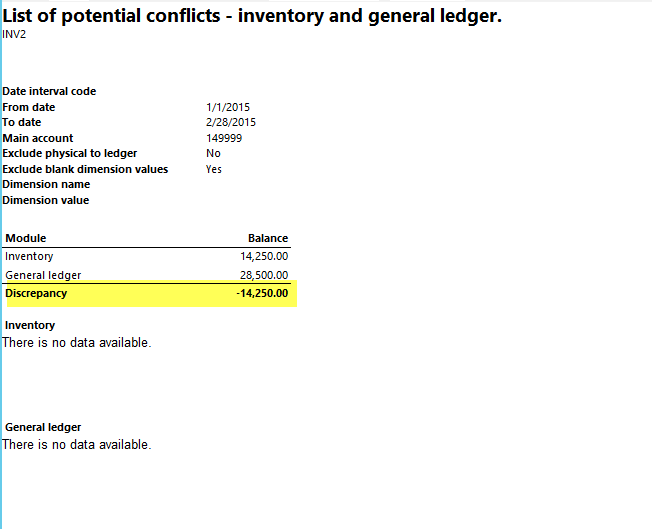 As you can identify from the previous screenshot, the potential conflicts report provides some additional information on the underlying transactions that caused the discrepancy. Yet, this report does also not give any hint why the discrepancy arose; that is, which ledger account is left out. The next test that I did was trying to filter the inventory value report on a specific item (“resource”) as shown in the next screen-print. 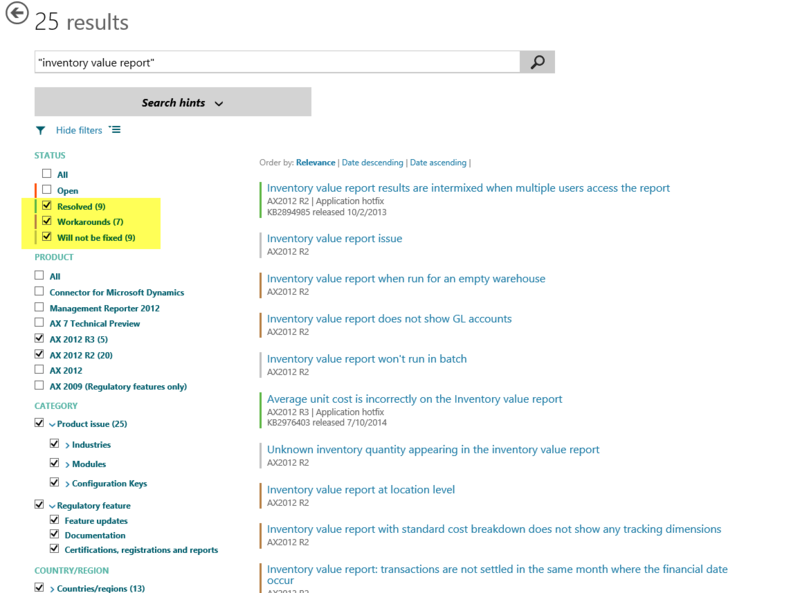 The inventory value report does indeed apply the resource (item) filter but does now show a discrepancy between General Ledger and inventory that does not exist and is only caused by the fact that the ledger transactions are not filtered correspondingly. This outcome and the previously identified problem with the date filters illustrate that filtering transactions in the inventory value report based on date intervals, items, item groups and alike needs to be done with utmost care and does not necessarily provide you with the outcome you expect. 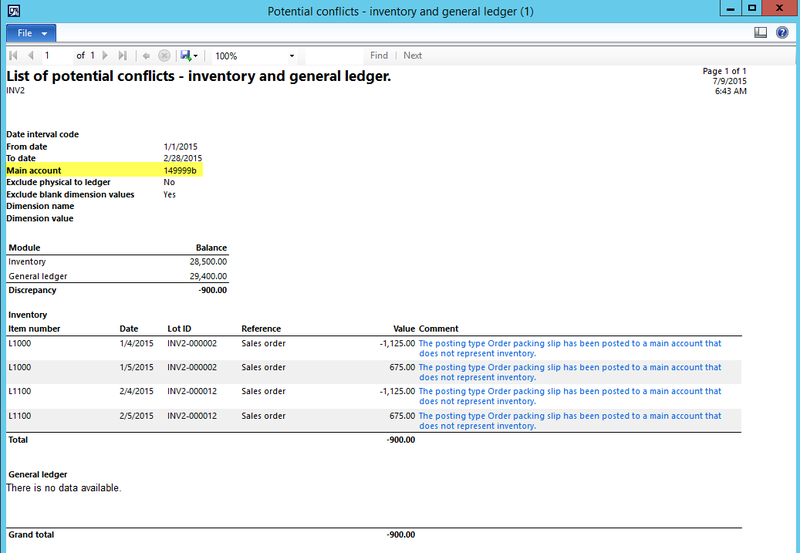 After trying to filter transaction in the inventory value report, I tried the same with the potential conflicts report. Please see the next screenshot. The result of this test was the following report that shows a discrepancy between inventory and General Ledger but does not provide any additional information. I find this outcome very confusing as the discrepancy illustrated indicates that something must be wrong but that no additional details for the identified discrepancy can be provided. The issue here seems to be once again that the report filter for the item “L1100” did not similarly filter the corresponding ledger transactions. The next issue that I experienced with the inventory value report and the potential conflicts report is related to service items used for subcontracting. 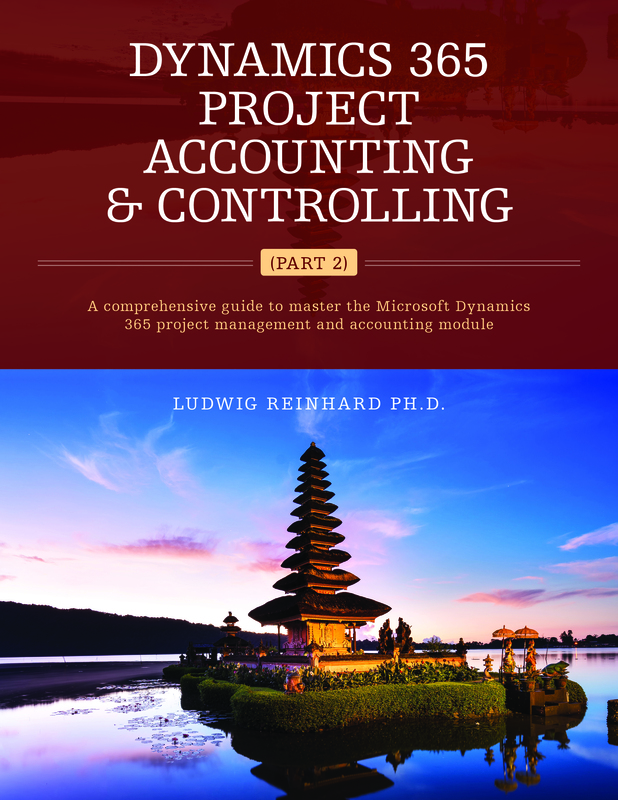 According to the Dynamics AX manuals and TechNet, subcontracting items shall be setup as “stocked service items”. See for example this Website. To test how subcontracting service items are incorporated into the inventory value report, I setup a basic finished product “L6000” that consists of an item “L6001” and a subcontracting service item “L6002”. The next screenshot provides an overview on the finished product and its components. 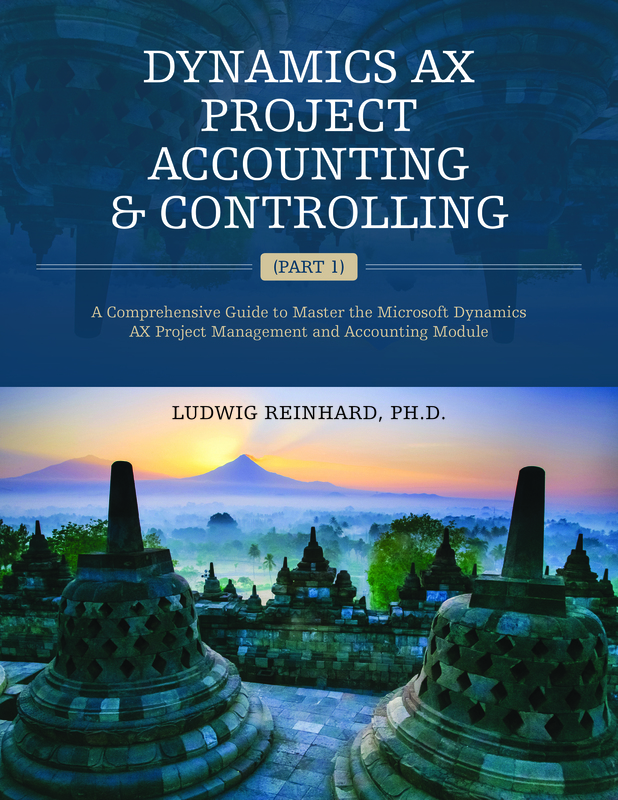 Please note that the subcontracting service item is setup with an item model group that has the physical and financial ledger integration parameters activated. If those parameters are not activated, the ledger transactions generated when recording production postings are wrong / incomplete from a finance & controlling perspective. 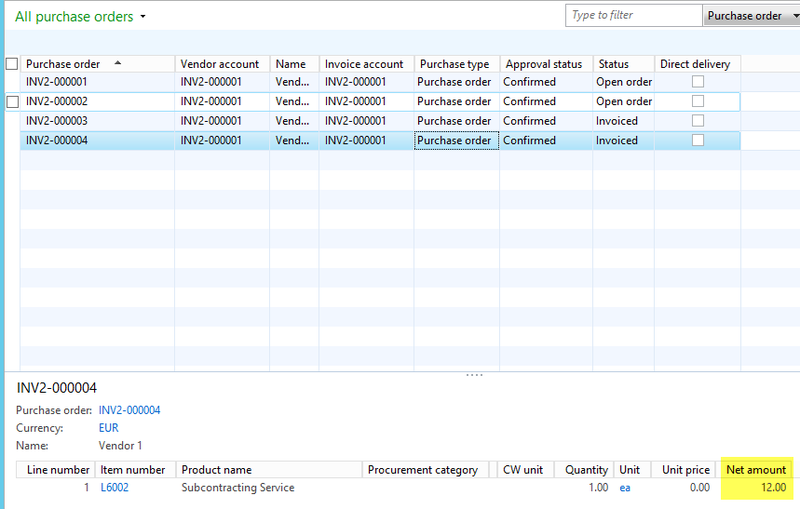 With this setup in place, the inventory value report shows a variance of 10 EUR after the production order is ended but before the purchase order for the subcontracting item is invoice updated. 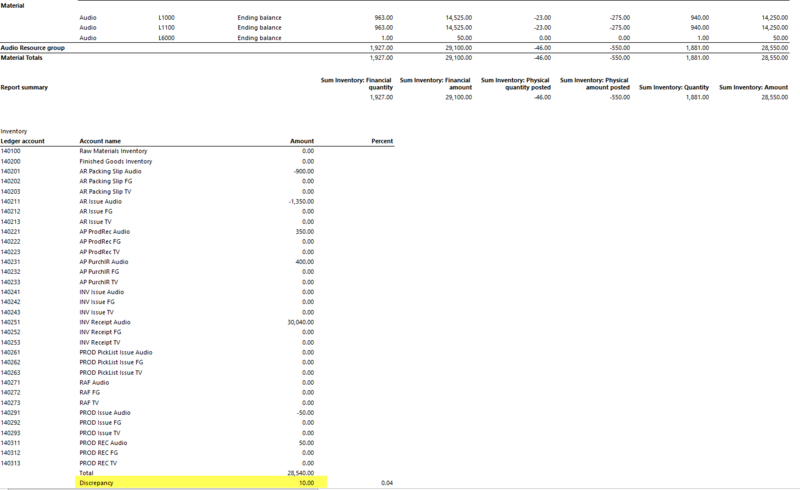 The underlying reason for the discrepancy shown in the inventory value report is because service items are by default excluded from the inventory value report. As long as those items are not invoice updated, the ledger postings are incomplete with the result that the inventory value report shows a discrepancy between the General Ledger and inventory values. 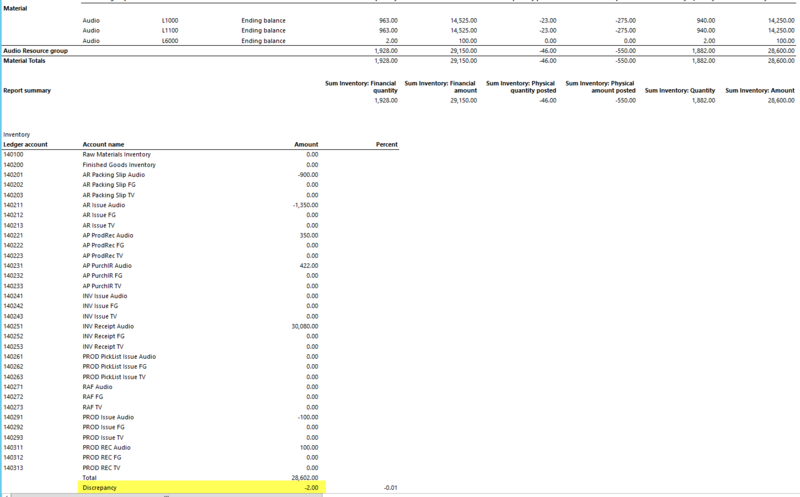 Please note that the potential conflicts report shows the same discrepancy. Once the purchase order invoice for the subcontracting item is posted, the discrepancies illustrated in the inventory value and the potential conflicts reports disappear. Note that the difference illustrated here does not arise if the purchase order invoice for the subcontracting item is invoice updated before the production order is ended. 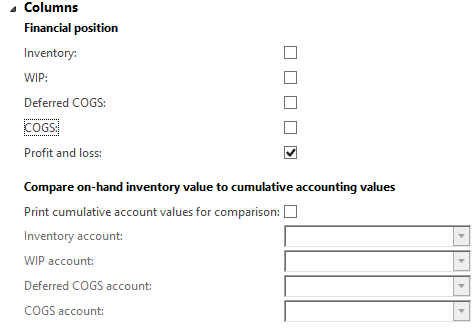 Irrespective of the last qualification, the finding that the inventory value report shows a variance unless the purchase order invoice for the subcontracting item is invoice updated is a major disadvantage – especially in companies with a continuous production – as the inventory value report and the potential conflict report will most likely always show a discrepancy between the inventory and General Ledger balances. 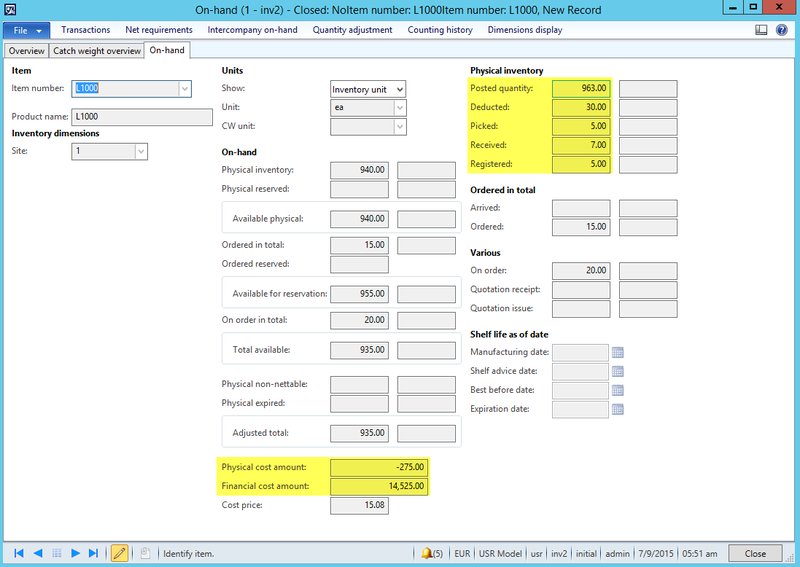 A second issue with subcontracting service items is that the difference between the ledger balance and the inventory balance does not disappear if (a) the production order is ended before the purchase order invoice for the subcontracting item is invoice updated and (b) the original purchase order price for the subcontracting item differs from the price the vendor finally charges. The following illustrations exemplify this problem. The subcontracting item vendor charges our company a 2 EUR higher price than originally calculated. After the production order is finished and the purchase order is invoice updated, the 2 EUR price variance remains as a difference in the inventory value report as illustrated in the next screenshot. This difference disappears with the recalculation of the inventory. 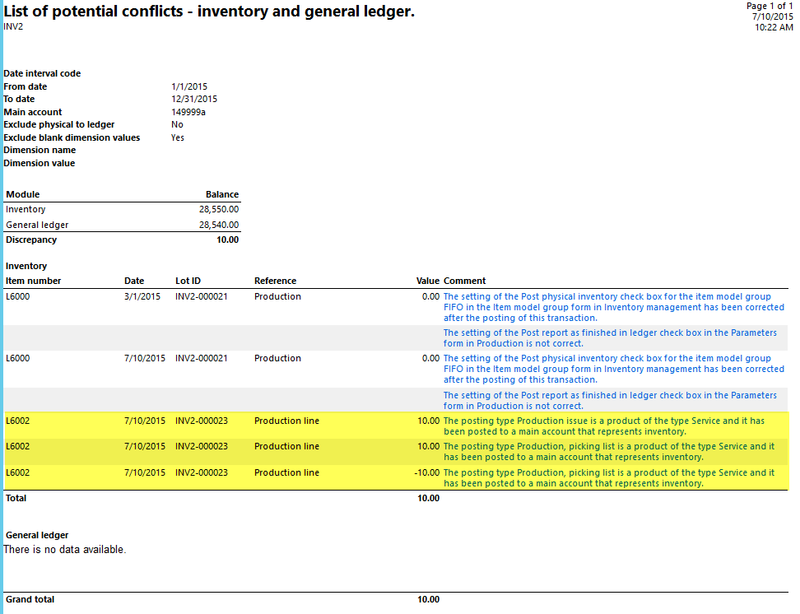 The various problems exemplified in this blog post allow concluding that the inventory value report and the potential conflict report are not suitable for the reconciliation of inventory and ledger balances especially in companies with a permanent “around the clock” production. That is because of the identified problems with the report filters and the problems identified in relationship to subcontracting service items. What is more, even if the inventory value report is run in batch mode, the report often runs – depending on the number of items you use in your environment – around 10-15 minutes. This fact and the lack of drill-down functionalities do not allow executing detailed inventory value analyses. In the next blog posts I will provide you some hints on how to avoid that differences between inventory and ledger arise in the first place and what other reconciliation tools exist that you might use for reconciling ledger and inventory balances. 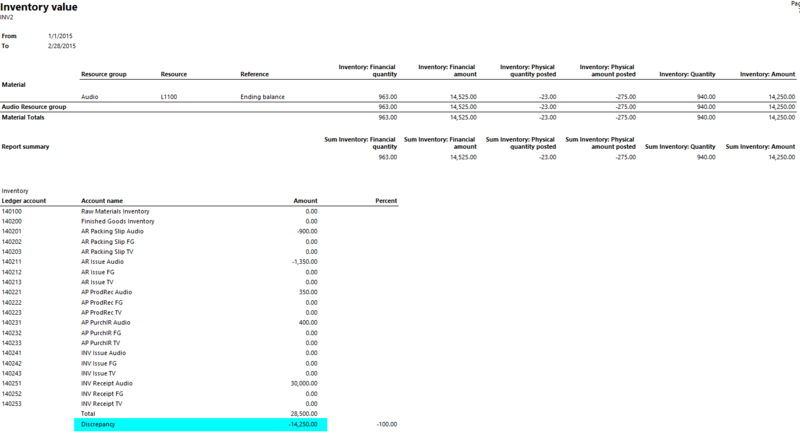 If you chose the print total quantity and value parameter instead, you will get a breakdown of the total inventory values (quantity and amount) in a physical and financial section as illustrated in the next screenshot. Activating the parameter “calculate average unit cost” results in the illustration of an additional column that divides the inventory values by their quantities. 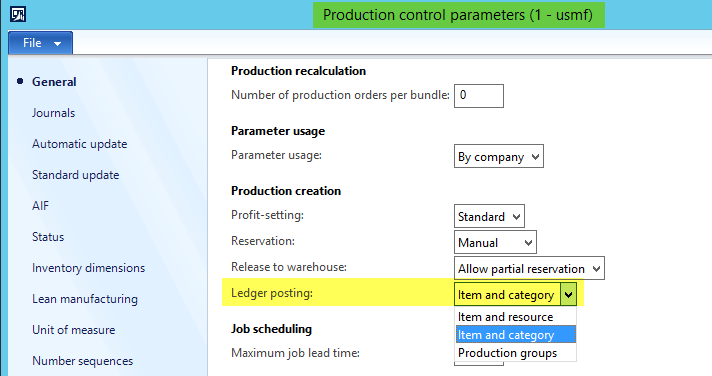 Finally, the parameter “include not posted to ledger” ensures that also transactions that have not been posted to ledger accounts are incorporated into the inventory value report. 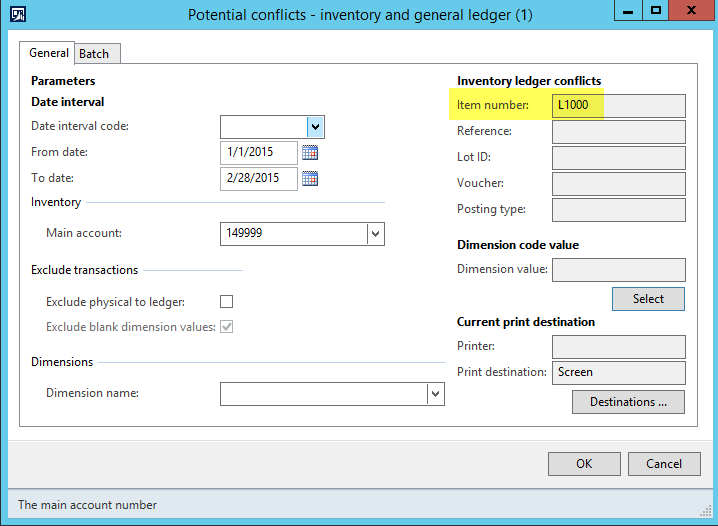 An example for “not posted to ledger transactions” are purchase order related packing slip postings provided that the following AP parameter has not been selected. This parameter is always selected and cannot be deselected. As illustrated before, the selection of one of these parameters allows reconciling WIP transactions that are for example generated when production routes are posted. 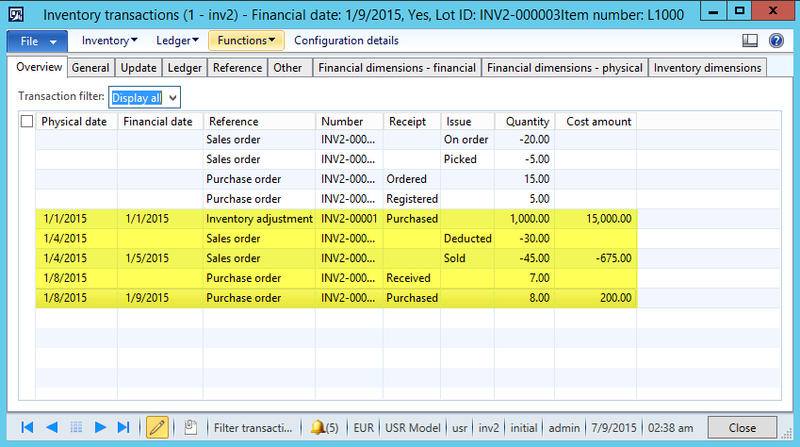 The level parameter allows you selecting either “totals” or “transactions”. Please note that the selection of “transactions” does have a significant influence on the time the report runs and should only be selected for a limited number of inventory transactions that need to be analyzed in detail. 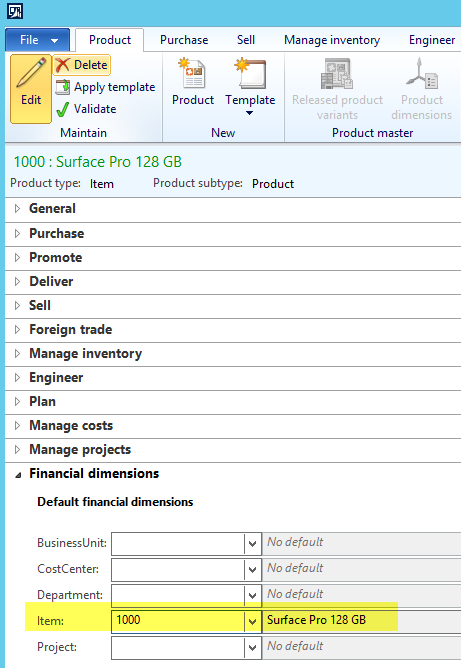 The last parameter “include beginning balance” can only be selected if you selected “transactions” at the detail Level. 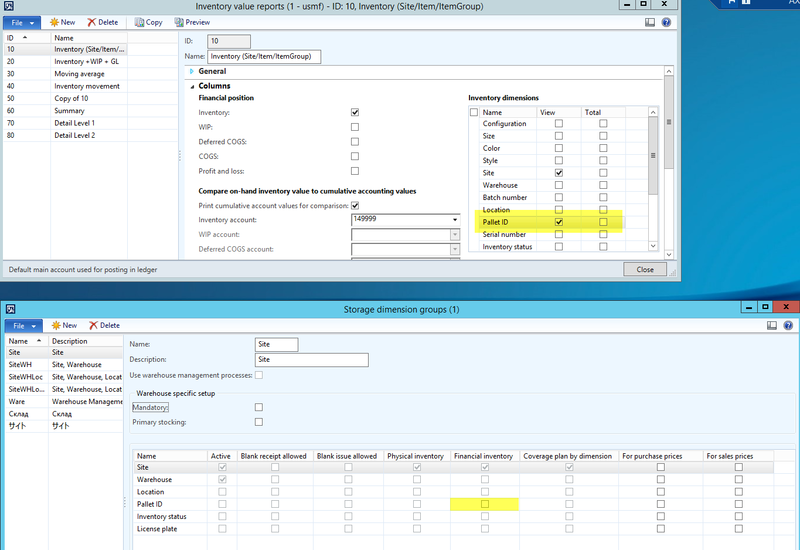 Selecting this parameter allows you incorporating beginning balance inventory transactions from earlier years. I hope that the blog posts on the inventory value report were able to give you some additional financial insights into the inventory value report and the inventory reconciliation process in general and look forward to seeing you in the next post on inventory reconciliation. The column section is probably the most important setup block of the inventory value report. Due to its importance, the different elements that can be setup in this block will be explained in detail based on several examples. 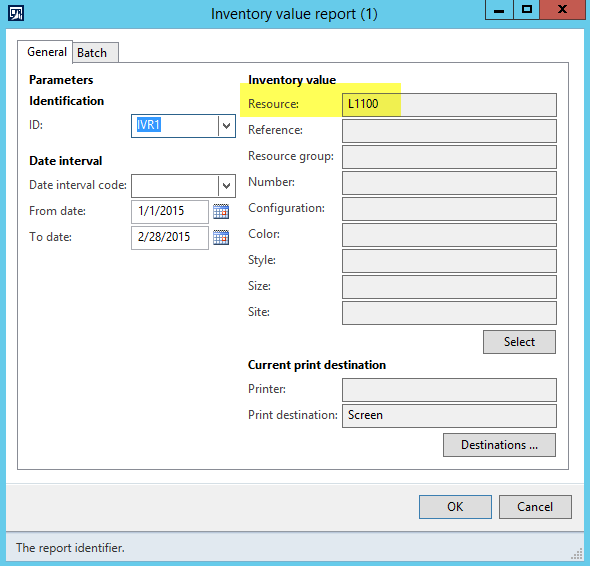 Activating the inventory parameter ensures that financial and physical inventory quantities and amounts are incorporated into the inventory value report. Please note that – from a finance & controlling perspective – the total inventory value is usually made up of the sum of the physical and financial amounts, as the risk of loss by chance and transfer usually shifts once goods enter or leave the company. 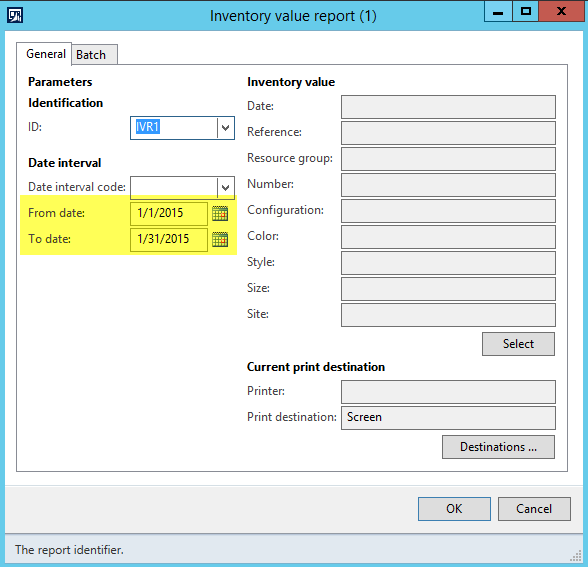 In respect to the inventory value parameter you might experience situations where the inventory value report shows you negative physical and/or financial amounts. This often happens when transactions are backdated or entered (too) late. The following example shows you an example of this phenomenon. A company purchases 1000 pcs of an item that has a current cost price of 10 €/pcs for this very price. Due to delays in the warehouse and the accounts payable department, the purchase order packing slip is posted in September and the purchase order invoice is posted in October. In the meantime 500 pcs of the item have been shipped to a customer. The shipment occurred in July and the sales order invoice was posted in August. 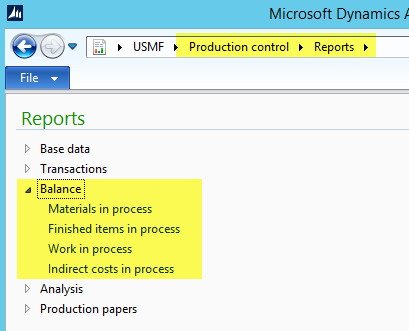 The following timeline summarizes the sequence of inventory transactions that were recorded in Dynamics AX. In July, after recording the sales order packing slip, the inventory value report shows a negative physical quantity and amount. In August, after posting the sales order invoice, the inventory value report shows a negative financial quantity and amount. In September, the inventory value report still shows a negative financial quantity and amount but a positive physical quantity and amount resulting in an overall positive inventory value. In October, the inventory value report finally shows the remaining positive financial quantity and amount. Activating the WIP parameter allows you reconciling the following two production WIP accounts that are setup in the inventory posting form. Please note that the activation of the following row parameters does also allow you reconciling other WIP Transactions such as labor cost transactions, indirect cost transactions and direct outsourcing cost transactions. 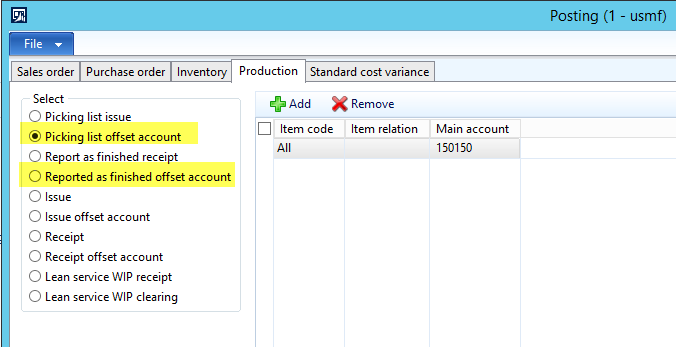 … the inventory value report does also allow you reconciling the WIP accounts that are setup at the cost category level. Note: For reconciling WIP accounts, you do not have to use the inventory value report but can also use the production control balance reports illustrated in the next screenshot. Within this subsection, I will explain the deferred COGS and COGS parameters together as they are related from a process flow perspective. 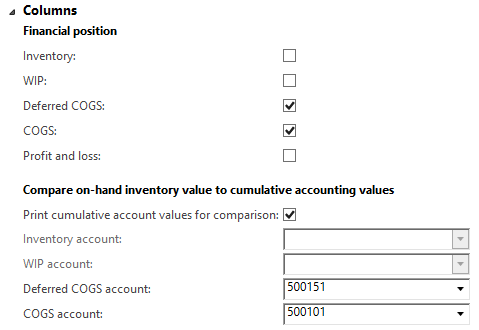 Activating the deferred COGS and COGS parameter allows reconciling the ledger accounts that have been setup in the following sections of the inventory posting form. 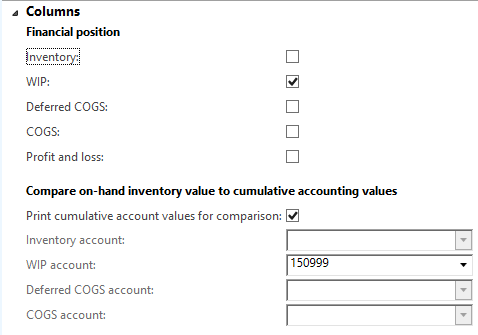 After activating the COGS parameter, the inventory value report shows a total value of 10 TEUR for the financial COGS amount. 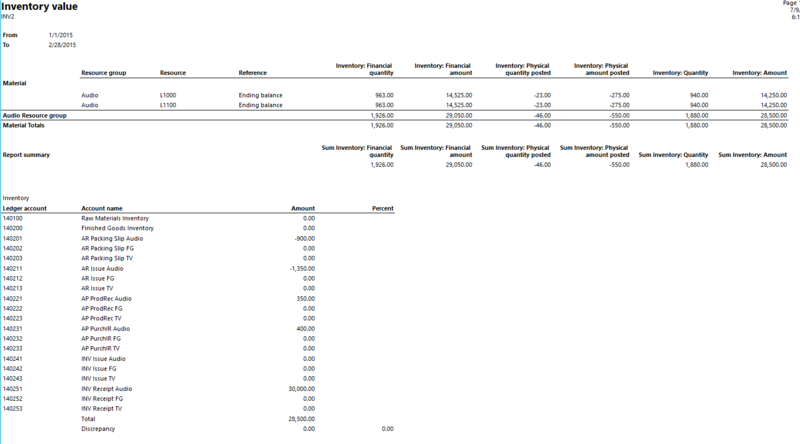 If you compare this amount with the balance that can be identified in the General Ledger you will notice that there seems to be a difference of 300 EUR between the ledger transactions and the inventory transactions as illustrated in the following screenshot. The underlying reason for this variance is that project related transactions are not included in the inventory value report. Sales order picking list transactions. The previously illustrated inventory value report does also show a deferred COGS amount of 314885.84 EUR. As before, if you try finding this value in the General Ledger you will probably notice a “variance” (see the following screenshot). The reason for this obvious difference is that the inventory value report shows values that are not limited to one single financial period. 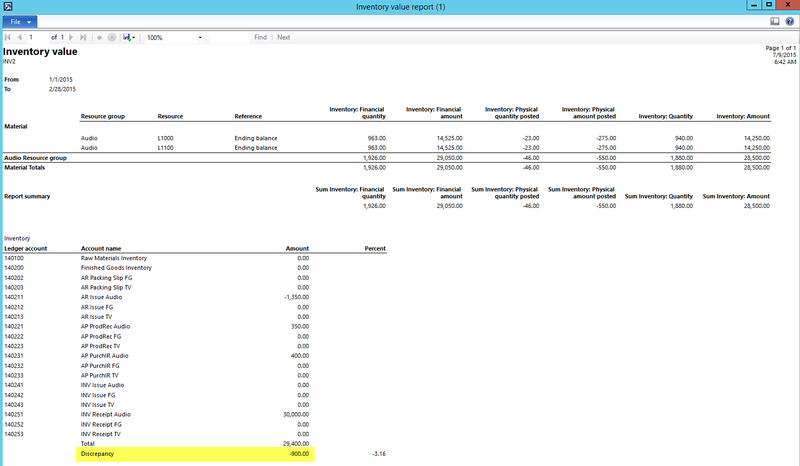 If you use the ledger transaction list report and not the trial balance list page, you are able to reconcile the amount shown in the inventory value report as illustrated in the following screenshot. 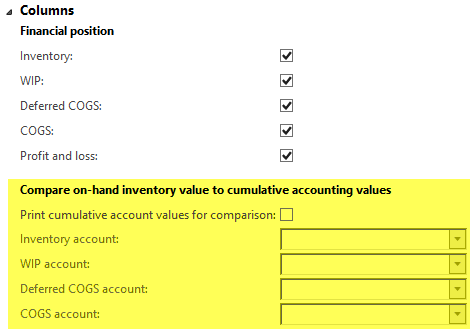 Note that you can also use the “shipped, not invoiced” Accounts Receivable report for reconciling the deferred COGS value shown in the inventory value report. 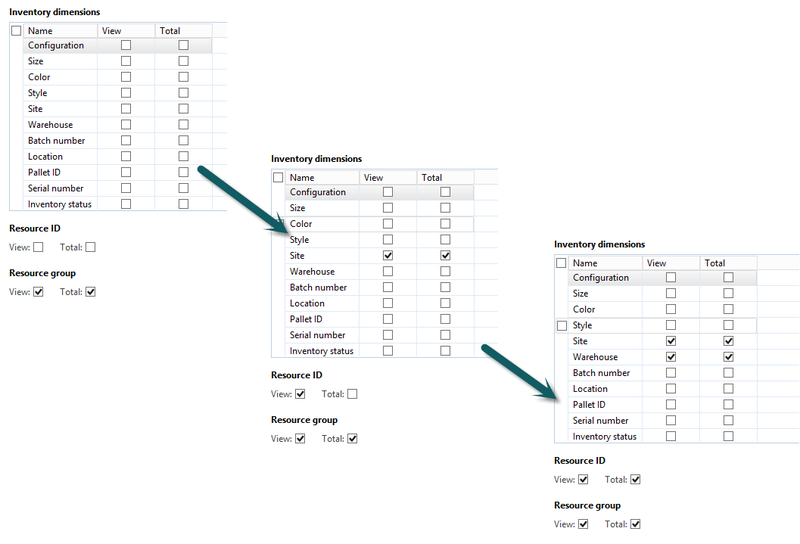 As illustrated in the examples before, for reconciliation purposes it is best setting up separate ledger accounts for each transaction type in the inventory posting and project posting form. Using the same ledger account for different groups – as illustrated in the next screenshot – can easily result in reconciliation problems. 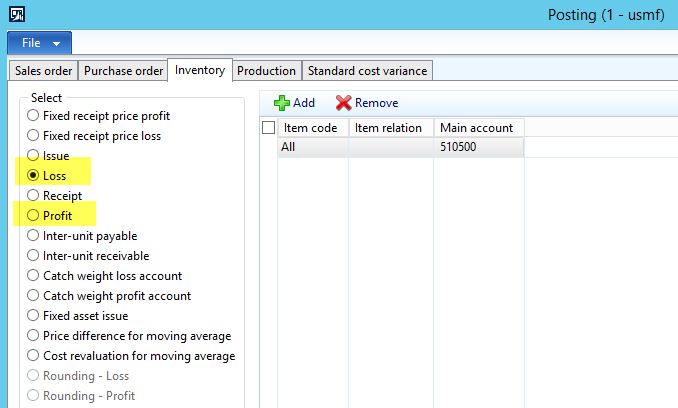 Activating the profit and loss parameter allows you reconciling the accounts that are setup in the profit and loss section of the inventory posting form (see the next screenshot). 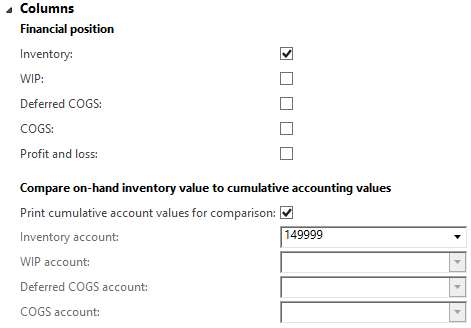 As a result, an inventory value report with this parameter activated allows identifying and reconciling inventory transactions that have been recorded through inventory adjustment and inventory counting journals. Please note that activating the profit and loss parameter does not allow you identifying those inventory transactions that have been recorded through inventory movement journals as those journals do not make use of the profit and loss accounts that have been setup in the inventory posting form. Hint: Analyzing inventory transactions that have been recorded through inventory adjustment journals can offer you a first sign whether or not something is possibly wrong with your warehouse processes. 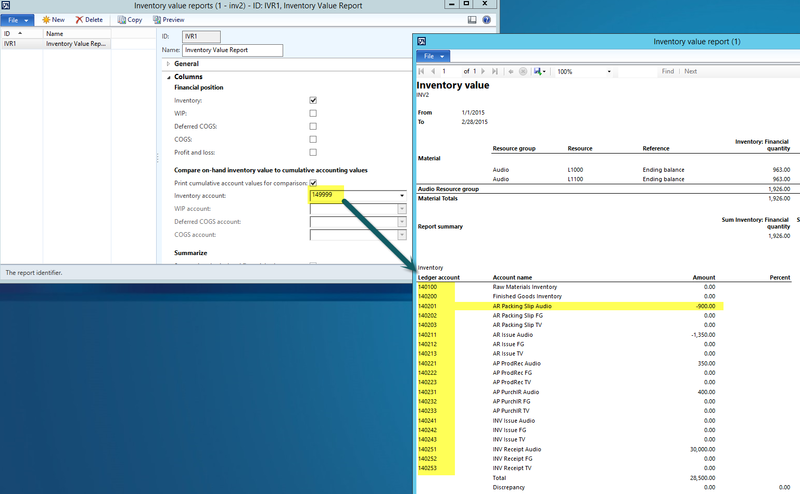 As illustrated before, setting up a ledger account in the yellow highlighted section of the inventory value report allows you a direct comparison of the inventory value amounts with the general ledger amounts. A prerequisite for this comparison is that summary accounts are setup in the Chart of Accounts as only summary accounts can be selected here. …to be continued in the next post. If you ever tried to reconcile your inventory balances with your ledger balances, you might have come across the inventory value report. This report and its setup is described in many blog posts and white papers. Yet, despite all the available information, the setup of this report often remains unclear for many finance users due to the numerous setup options and missing “best practice” guidelines. Select “posting date” or “transaction date”. Note that the transaction date option was introduced with the moving average inventory valuation model. For additional details, see this website. The dimension set allows you – in combination with the column setup of the inventory value report (see further below) – a direct comparison of the inventory and the ledger balances. 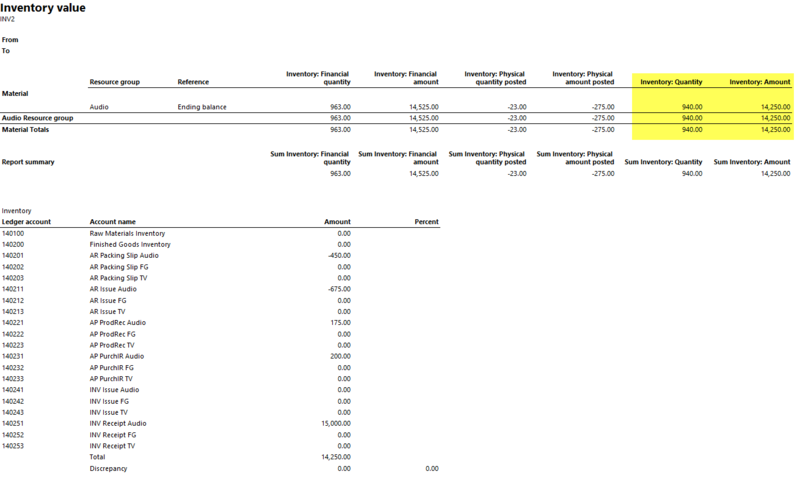 This is realized by showing a financial section at the end of the report. 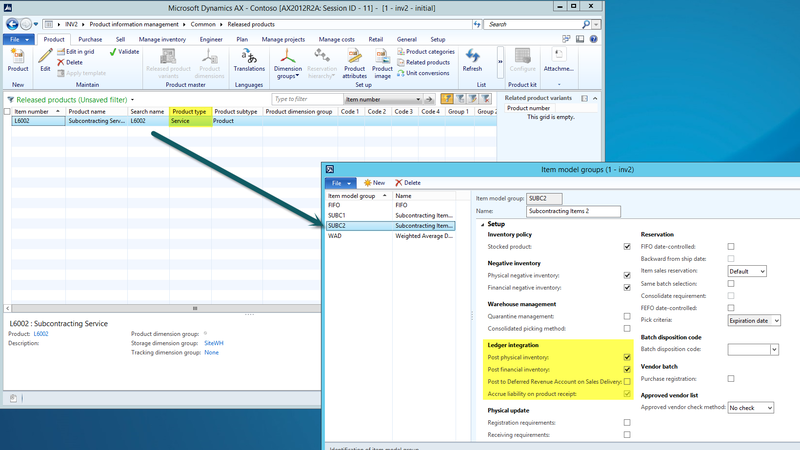 See the following screenshot for an example. 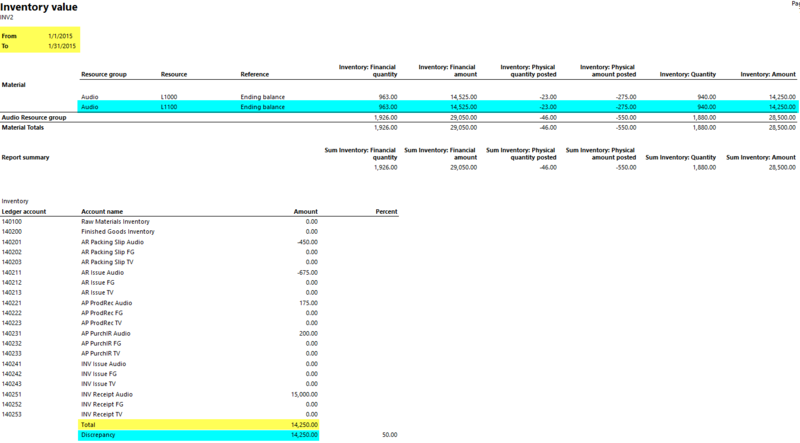 Please note that running the inventory value report with the main account and item ID financial dimension set requires that the General Ledger account structures include the item ID as a financial dimension and that all items are setup with their item IDs as illustrated in the next screenshots. 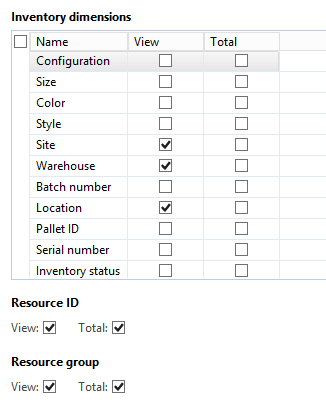 The parameters that you define in the inventory dimensions block influence the inventory dimensions, items, item groups and subtotals shown in the inventory value report. Please note that this setup needs to be in line with the setup of the storage dimension groups. As an example, selecting the “Palled ID” dimension does not make much sense if financial inventory values are not tracked at this level. From a “best practice” perspective, the setup of different inventory value reports with different levels of details can help you identifying discrepancies faster and easier by successively running the different report versions.